Home / Social Meida / How to generate traffic from Facebook? 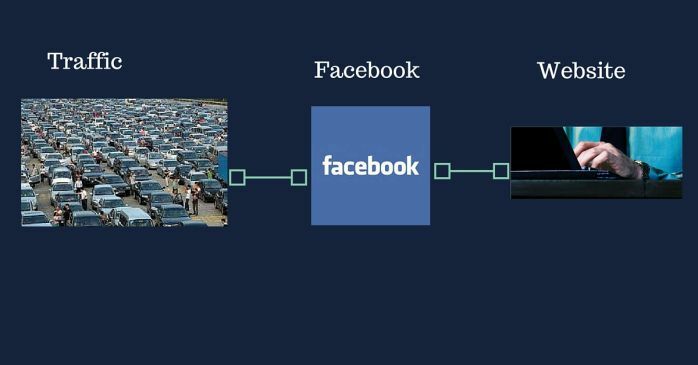 Facebook is the world’s most famous social networking website with around 1 billion users. Millions of people from different geographic locations access Facebook daily. The website is ranked second in terms of traffic generation after Google. Online business success depends on the targeted traffic generation. The audience who are interested in your business and services are termed as “Targeted audience”. This social media platform is the best destination to gain targeted traffic to your website. Many Facebook users beg their friends and spam at different FB pages and groups. But, you can’t generate more than 80-100 traffic by this way. Also, the group owners can ban you. 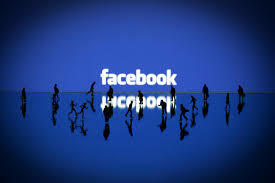 Facebook page: – Facebook page offers you an opportunity to feed your services to your audience. Create a facebook fan page. Post latest offers, services and website post links here with a moderate frequency. 1 or 2 posts a day will work fine. 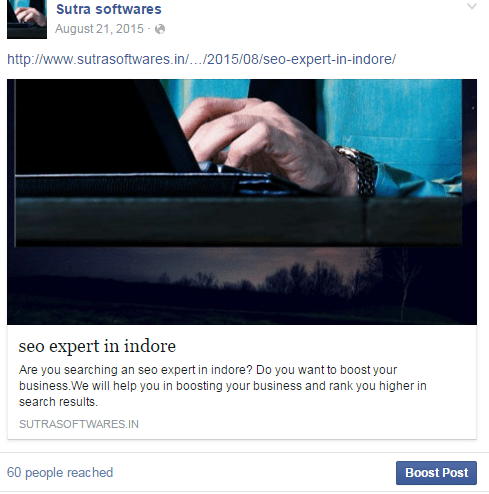 Optimize your FB page. Insert website URL in the FB page. Also, add a call-to-action button like contact us, sign-up button to direct your audience. It helps the visitor to reach your website easily. FB offers website promotion services to page owners. Open your FB page and look at the website URL column, you will see a promote website button. Add balance to it and you will receive targeted traffic to your website that will help in leads generation and conversion. Remember the banner should have 20% text only. FB don’t allow promotion of link or banners with 20%+ text. Add small budget to the post and see the results. If you need effective results from the post then do use catchy titles and banners with 1200×440 pixels. If you are posting a link then use 1200×440 pixel thumbnails and also a single or two catchy text lines in the start of the post. The thumbnail or banner you are using must define the content in the first look. 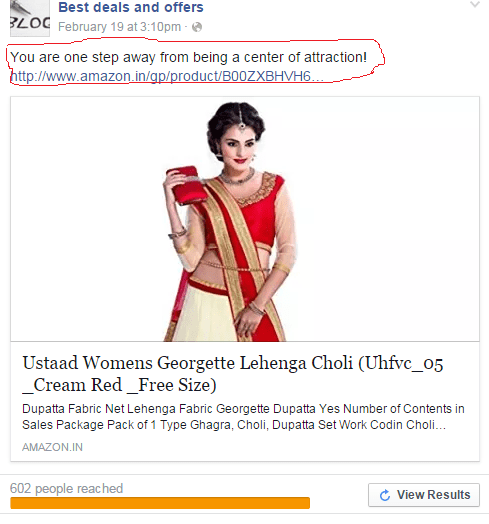 See the below example, the post is clearly defining the promotion of a dress. If you successfully spread your message to your audience, then they will click on it. The headline is also catchy. As mention, the post title should be very catchy that will make your article viral on the Facebook. You will gain shares, likes, and comments along with website clicks. Also, your page will gain likes. An effective title and headline create curiosity in the audience. Do use questions or numbers in the headings. The use of How to be a perfect content writer or 8 tips to engage the audience on your website etc will increase click trough rates. You have three options to feed your post to three types of audience. You can reach to people who liked your page, people who have liked your page and their friends and can set your audience preference based on the age, location, interest, and gender. Always add URL with the banner promotion or include URL information inside the post if you are posting on different platforms other than Facebook Page. Otherwise, it’s a big waste of time and money. 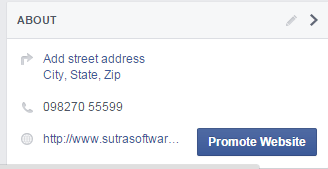 Join targeted FB groups: -Suppose my business is related to software development. I should join Groups related to software development. I will gain the actual audience required for effective promotion of my website and it will generate traffic also. Many people ask questions in the groups. You can insert the link URL in the groups while answering their questions. It will drive traffic to your website. Paid posting on other FB pages: – There are many FB pages with more than 100k, 200k likes, and followers. Select pages that match your business niche. Contact the page owner and purchase paid post on his/her page. It will give at the ton of traffic in cheap rate. You can find many FB pages here http://shopsomething.com. Hope, the article is helpful for you. Please comment and share it. Previous How to write chemical equations in HTML?